St. Patrick's Day countdown sign is a large metal design that features numbered metal tiles and Irish witticisms along with shamrocks and Celtic knot-work. An' did you ye hear the news? 'Tis but a few fine day 'til the wearing' o' the green. Don't ye be forgettin' tis only (space for the numbered tiles) days 'Til the pipes be callin' and we be singin' dancin'and carryin' on. 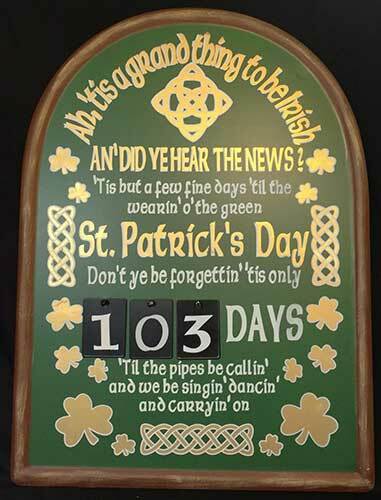 The St. Patrick's countdown sign is a painted metal design with a beveled border; it is ready to hang on your wall. The large Irish pub sign is complete with numbered tiles that you place to indicate the days remaining until St. Patrick's Day. The Irish plaque is enhanced with Celtic knot-work and shamrocks along with an Irish quip relating to the High Holy Day; it measures 16" wide x 22" tall. This Irish decoration is boxed with Celtic knot and shamrock history cards, complements of The Irish Gift House. Minor assembly is required. Irish bar or pub sign features metal construction that is enhanced with shamrocks and clovers along with the words, I'll be Irish in a few beers. Irish Bar or Pub Sign features shamrocks and mugs of beer along with the quip, In heaven there is no beer, That's why we drink it here. Irish bar or pub sign features a colorful metal design that is complete with shamrocks and clovers along with pints of beer and the statement that reads, F.B.I. Full Blooded Irish. Metal Irish pub sign features Céad Mile Fáilte along with Celtic knot-work. Metal Irish pub sign features the Gaelic toast sláinte along with Celtic knot-work. Irish bar sign features the quintessential Irish blessing along with Celtic knot-work on a colorful metal design.